The two figures below come from recent posts on climate change and AI. Please read them. The squiggles in the first figure illustrate uncertainty in how climate will change due to CO2 emissions. The squiggles in the second figure illustrate uncertainty in the advent of human-level AI. Many are worried about climate change because polar bears, melting ice, extreme weather, sacred Gaia, sea level rise, sad people, etc. Many are worried about AI because job loss, human dignity, Terminator, Singularity, basilisks, sad people, etc. 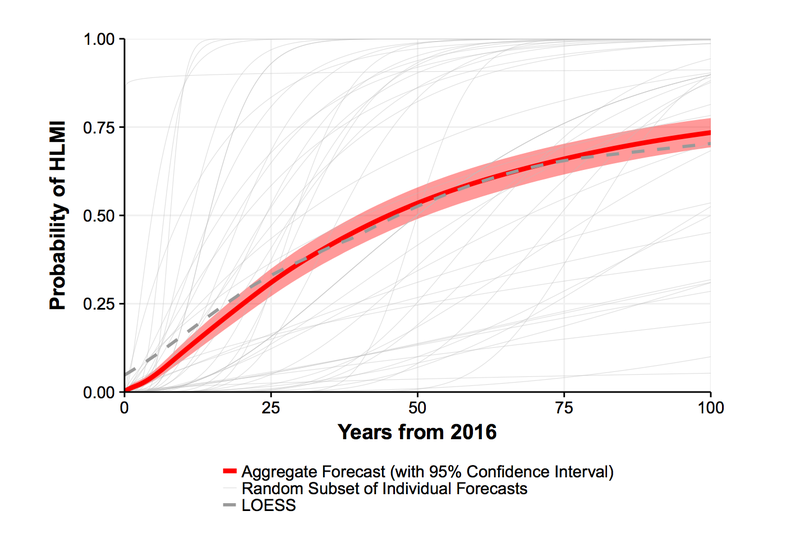 You can choose to believe in any of the grey curves in the AI graph because we really don’t know how long it will take to develop human level AI, and AI researchers are sort of rational scientists who grasp uncertainty and epistemic caution.